In his role as Executive Director, Theo Ndindwa leads iKapa by nurturing professional partnerships that support the growth of the organisation. He is a director, producer, choreographer, dancer and social development entrepreneur with substantial international experience. Mr. Ndindwa has completed various Leadership and Arts Management courses throughout South Africa, and graduated from Common Purpose in 2010. Following his return to Cape Town to assist Dance 4 All Outreach, he established a professional dance company, which was launched in November 2005. During this time, he choreographed and performed for a range of events, commercials and film houses throughout Southern Africa. He has worked with the Cape Town City Ballet and Free Flight as a dancer and choreographer. He continues to work on a freelance basis, after founding iKapa Dance Theatre with co-director Tanya Arshamian in November 2007. Mr. Ndindwa’s professional international credits include working with the Ensemble Group (Scotland) at the Edinburgh Festival, Norman Douglas, Cathy Moston, Christopher Hampson, Raphael Bonachela, David Brown (US) and Tony Miran (Spain). 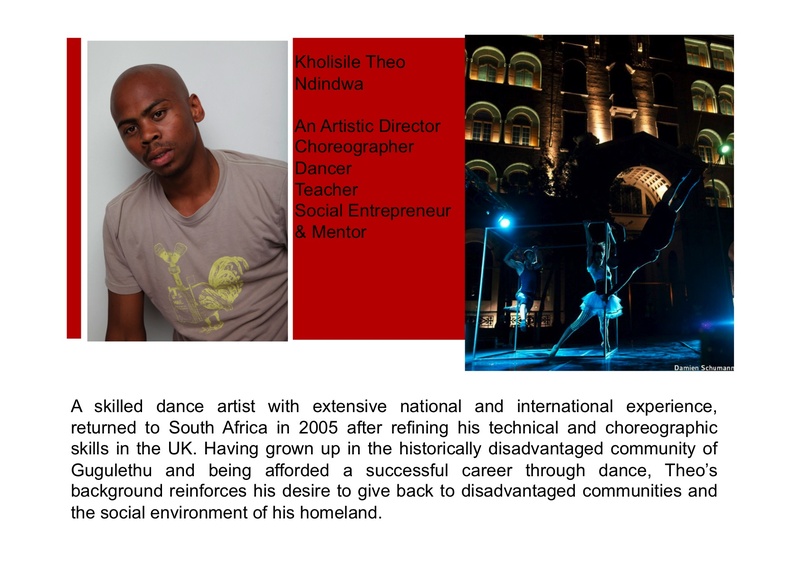 Mr. Ndindwa has also worked with Ballet Soul, Dance Nomad, and Tavaziva Dance Company, and joined Phoenix Dance Theatre in 2004. Mr. Ndindwa began his training with the Dance 4 All Outreach Programme and later at the University of Cape Town Ballet School. He trained with Rambert School of Ballet and Contemporary Dance and toured the UK with Ballet Central.